One phone call changed the course of journey for Vhere. It almost changed the very basis of the name `Vhere’ which means `relative position’ in Latin. And the Latin word was an apt description of the work Vhere initially wanted to be associated with. The chosen path was in the area of GIS and GPS. But that call of destiny from one of the Indian law enforcement agencies in 2006 had pulled Vhere out of its chosen path and put it firmly in the less trodden area of communications’ intelligence and cyber defense. And the journey began with the ultimate goal of making a safer world. And that new world is throwing up challenges everyday which motivates Vehere to come up with cutting edge technological solutions. In return the company is catapulted into a different league of growth. It is consistently ranked among the fastest growing technology firms. Vehere has featured in the Deloitte list of fastest growing technology companies in India. Vhere was founded in 2006 to revolutionize the communications and cyber intelligence technology. As Naveen puts it : “We want to enable the national security agencies to make the world safer. So our area of work ranges from ocean to space.” He opines that the core principle is simple – no matter how much complex a problem is. Vhere works with the belief that where humanity is out exploring the newer communications platform, it is fundamentally essential to collect, decipher and analyse information from diverse networks and data sources while protecting the privacy rights. The job of protecting the privacy and security of sensitive customer data dominates the company’s policy. So much so that the technology company does not even apply for patents as that would require the company to put up critical information in the public domain. And that may put the country’s security at risk. 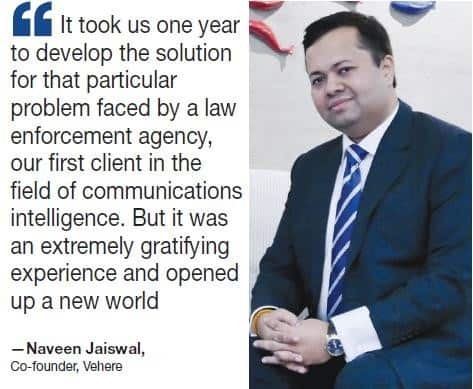 Vhere’s solutions help law enforcement and national security agencies to combat crime and terror in the electronic platform. It helps the government agencies to protect critical national infrastructures and data from cyber threats. So, Vhere has to remain contented with the publication of research papers in prestigious institutions like IEEE, SPRINGER, IJCN etc. The company publishes a new research on an average every quarter. This has allowed the company to emerge as the thought leader in the cyber intelligence and cyber security space. Talking of protecting privacy rights, Naveen says it is a tricky affair.. He believes that the idea is to protect the security of nation without infringing privacy rights of citizens or netizens. Government remains the main client. Naveen further adds, “No company working in this field can survive without government support. All our researches are primarily aimed at creating solution for the government.” He too believes like other experts that post 9/11 the homeland security has got a different dimension. It is not the combats fought at the borders. It is not the weapons are used in face to face battles fought in the terror zones. But it is a war not visible to most of us. The wars are now fought in the cyber space where enemies are active to debilitate critical infrastructure. Naveen, who heads the research and development wing of Vhere speaks from his experience from day-to-day scenarios. He believes that this is an area where no laxity can be allowed. He considers it as an everyday war fought at the government level. This is electronic war. Without revealing much he can only say that it is not about terror groups or criminal lords. Globally countries are spending a hell lot of money to gain supremacy in the electronic warfare. With more and more rise of this tussle among countries , technology which augments Human Intelligence is in a rising demand curve. Hence cyber space which is yielding power to humans has also become a menace. In other words, this is a double edged weapon which needs to be carefully handled so that cyber and communication-related crime could be curtailed, controlled and curbed. In-spite of tremendous technological advancements , predicting a cyber crime incident is not easy. It needs constant vigil and innovation. And, Vhere endorses it due to its dedication and innovation. Supporting this idea of human interference, Naveen said, “Here comes the need for analysis. It requires getting the right information from the available data, converting it into usable piece of information , finding patterns, applying artificial intelligence , storing it and then finally making predictions in real time.” Analysis of data from multiple sources in varied time frames is the name of the game. Can anyone be perfect in handling cyber crime incidents? Perhaps the answer lies in the increasing amount of cyber crime incidents globally. Pragmatic and grounded, Naveen clearly states no technology, no device can be fullproof. So what is the way forward? He puts three basic questions on the platter. How much risk one can live with? How quickly one can close the gap? And these three questions form the base of security needs as well as requirements. For a country. For an enterprise too. Believing this , Vhere is foraying majorly in the enterprise category. 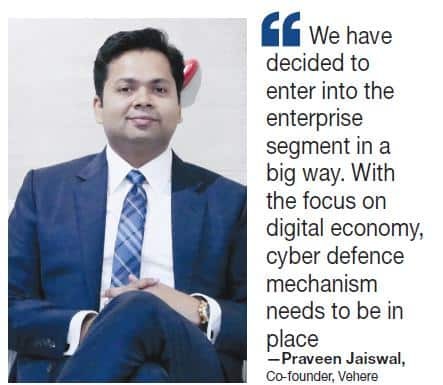 Praveen Jaiswal, a Delhi School of Economics alumnus, taking a cue from his partner Naveen’s thoughts , stated the future plans for Vhere. He heads the business and business development related activities of the company. Besides enterprise segment, Vhere plans to be in the foreign markets like US and Europe. In the niche sector of security where Vhere is in, there is no competitor in the domestic market, claims Naveen. Globally, Israel is the major player in this segment. This is definitely a proud fact to bask in. But this unique position also gives rise to perception problem. Naveen and Praveen, both say how the industry in general and the buyers would react in complete surprise and disbelief when they come to know of the roots of the company. A technology company working in this niche area and having roots in India comes as an incredible information. 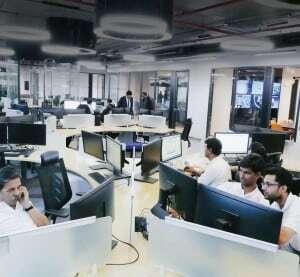 But more surprise is in store for them when it is disclosed that Vhere is from Kolkata and not from the Indian Silicon Valley City of Bengaluru. Vhere: On its path of making a safer world 0 out of 5 based on 0 ratings. 0 user reviews.